Enjoy the soft comfort of this unique sectional sofa group in your living room or den. You and your guests can comfortable watch your favorite sports team, or watch a movie while supported in plush softness. Stretch out upon the elegant chaise at the end of the piece with your favorite book or magazine. Available in a wide variety of fabric options to choose from, find the look that best suits your own personal decor today! The Townsend Casual Sofa Sectional Group by Rowe at Saugerties Furniture Mart in the Poughkeepsie, Kingston, and Albany, New York area. Product availability may vary. Contact us for the most current availability on this product. 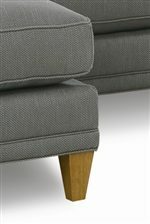 K624-LAL Large Armless 1 68" 37" 36"
K628-LSE 3-Seat End w/ Corner 1 97" 37" 36"
K621C-RSC Chaise End 1 33" 60" 36"
Tailoring Smooth clean edges give this sofa sectional a complete look. Arm Smooth track arms create a retro contemporary style. Padding & Ergonomics The standard 300cc cushion consists of a high-resiliency polyurethane foam core for the right amount of support, sink-in comfort and bounce-back. It is then wrapped in a layer of plush polyester fiber for softness and shape. Feather Soft, Extra Plush (M850) and Extra Firm Cushions also available through special order methods. Adding comfort and versatility to your home, enjoy the impressive styling of the Townsend collection in your living room or den. Perfect for families in need of large seating options, the Townsend collection offers several different pieces to fit your lifestyle plus a spacious 89 inch sofa. Gather family and friends together to watch the big game or your favorite movie while relaxing with this casual collection which offers plush cushions, track arms and exposed wood legs that allow everyone in your group to sit back and enjoy! The collection also features luxurious chaise pieces to add onto your sectional group for an elegant look. Available in several different fabric options, and Casually styled, the Townsend collection easily fits into your home, allowing you to create a look that's right for you! The Townsend collection is a great option if you are looking for Contemporary furniture in the Poughkeepsie, Kingston, and Albany, New York area. Browse other items in the Townsend collection from Saugerties Furniture Mart in the Poughkeepsie, Kingston, and Albany, New York area.